Home foreclosure starts at state-chartered banks continued to drop below 2008 levels last year, dropping to less than half the number started in 2011, when foreclosures peaked. PORTLAND, Maine — The number of foreclosures by banks chartered in Maine dropped again in 2016, marking a return to levels in place before the Great Recession. Maine’s Bureau of Financial Institutions reported state-chartered banks initiated 146 foreclosures in 2016, down from 176 the year before and a peak of 375 in 2011. 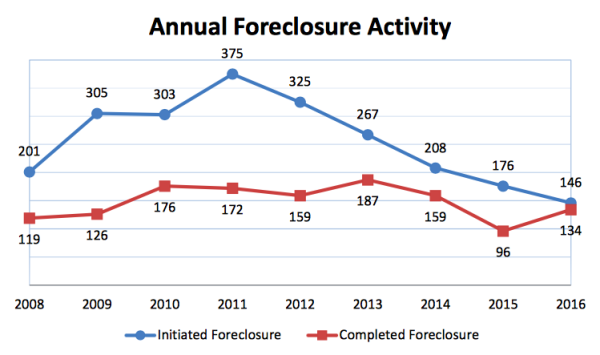 “Foreclosure activity at Maine’s state-chartered institutions has steadily declined over the past five years and has reached pre-recessionary levels,” at those banks, according to Lloyd LaFountain, superintendent of the bureau. The bureau reported that measures of potential foreclosures to come have also leveled off, with about 1 percent of the state’s roughly 74,000 mortgage holders behind on payments by less than 90 days. Another 0.57 percent were behind 90 days or more. Combined, the measure of delinquent mortgages at the end of 2016 was on par with the previous year, at 1.59 percent, and down from 1.87 percent in 2014. The new law validated past transactions that relied on the Mortgage Electronic Registration System, including foreclosures, and assures homeowners clear title, but requires future foreclosures to meet the requirements of the court decision.